Are you worried about bug bites that blister? The response to a bite from insects is variable and depends on a variety of factors. Most insect bites result in pain, swelling, redness, and itching to the affected area. But in some cases, people have severe reactions to mosquito bites, bed bug bites or spider bites. The most frequent types of bites that may cause blisters are bed bug bites and mosquito bites. In this post we’ll discuss the types of bites that may cause blisters, and how to treat them with natural remedies. Can bed bug bites blister? Mosquito bites: why do they cause blisters? Could it be a spider bite? Insect bites that blister: what to do? What are the best natural herbal remedies for bug bites? Can essential oils help soothe insect bites? What if you develop a severe reaction or your bite looks infected? The most frequent types of bites that may cause blisters are bed bug bites and mosquito bites. What differentiates bed bug bites from mosquito bites? If you’re unsure whether you’ve been bitten by mosquitoes or bed bugs, check this page. Bed bug bites often look like small, flat or raised areas that may become inflamed, itchy, red or blistered. Here you’ll find out why bed bug bites may itch. They are quite similar to mosquito bites – a slightly swollen and red area that may itch and be irritating. The bites sometimes appear in a straight line. Other symptoms of bed bug bites include insomnia, anxiety, and skin problems that arise from profuse scratching of the bites. Bed bug bites don’t necessarily blister, but they do in some cases. Bed bug blisters may take a few days to appear after being bitten. Be aware that bed bugs are notoriously difficult to eliminate once they’ve established. If you’re looking for bed bug treatments, diatomaceous earth is a cheap and non-toxic alternative to pesticides. I explain why it’s a very effective solution in this post. Also consider buying a bed bug killer spray, such as EcoRaider. I recommend a few other effective & natural sprays here. 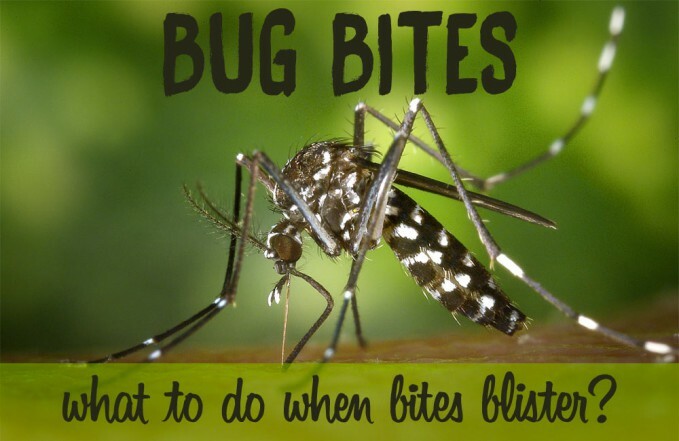 If you are particularly sensitive to mosquito bites, you may develop bullae (fluid-filled blisters) or weals (circular, fluid-filled areas surrounding the bite). Many of the mosquito saliva proteins can cause reactions such as blisters. Mosquito bites can also cause more serious immune reactions. 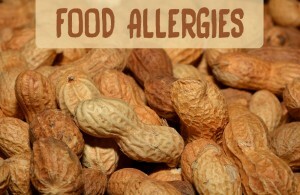 Severe allergic reactions are not common, but they may result in blistering rashes, bruises, or large areas of swelling at the bite sites. People who experience extremely large areas of swelling after a mosquito bite have been dubbed as having “Skeeter Syndrome“. Did you know that lemon eucalyptus is the most effective natural alternative to DEET? Read this! Spider bites typically form a blister on top of the bite within 1-2 days. There are lots of different types of spiders. If a blister form at the bite site, it may be a brown recluse spider bite. This type of spiders is usually found in the south-central part of the United States. Brown recluse spiders live in dry, hot and abandoned areas. The bite may not appear to be serious immediately, but may become severe after some time. Sometimes, the swelling may form a blister. Mild to intense pain and itching for 2 to 8 hours following the bite. A dark, scabby material called eschar may cover the blister within a week after the bite. This ulcerated area can continue to enlarge if not treated promptly by a physician. Brown recluse spider bites may take months to heal. If you suspect this bite, see your doctor. Also, get medical help if you are not sure whether the bite was from a poisonous spider. Note: Spiders are not insects. They have eight legs, while insects have six legs. There are a number of other differences too. If you have a spider bite, consider applying some activated charcoal on the bite site. According to top10homeremedies.com, It helps draw out toxic substances from the body and reduce inflammation from a spider bite. Mix some activated charcoal powder with water, and apply the paste on the affected area to neutralize the toxin. You can also apply black drawing salve, which works very well. Like spiders, ticks are not insects. They are actually arachnids, which means they’re more closely related to spiders than they are to mosquitos. Bites are not usually painful and sometimes only cause a red lump to develop where you were bitten. However, in some cases they may cause swelling, itchiness, blistering, and bruising. If you’ve been bitten by a tick, you should read this post. Also get rose geranium oil as a natural tick repellent! Mites cause very itchy lumps to appear on the skin and can also cause blisters. Flea bites may blister. However, this isn’t the common skin reaction. Here you’ll find the common symptoms of flea bites. Bees are the most typical stinging insects (this includes wasps, hornets, and yellow jackets). Pain from a bee, hornet or wasp sting is immediate, with rapid swelling, redness, warmth and itching at the site of the sting. Blisters may also occur. Not everyone reacts to bug bites in the same manner. Some people may develop blisters after being bitten by bed bugs for example, while others won’t. Scratching a bug bite can make the bite more itchy and swollen. You’ll also increase the chance of a secondary infection. Learn why scratching it makes the itch and symptoms last longer. The cold temperature from ice can help numb the nerve endings, thus relieving the itching sensation caused by bug bites that blister. It will also help calm the swelling. For other home remedies to relieve itching, read this page. 3. Cleanse the area with mild soap, rinse and dry. Once the area is clean, you may apply a soothing balm, such as the soothing balm On the Go. This balm will help relieve symptoms and speed up healing. 4. Use an adhesive bandage to protect the blistered area and prevent infection. In a protected environment the blister will heal off best. If a blister pops up, it looses its protective layer and it allows bacteria to enter the wound. However covering a wound or not is case specific and needs to be evaluated by a doctor (source). Natural treatments are often used and they are usually quite effective to treat insect bites that blister. This herb is a helpful herbal remedy in the treatment of mosquito bites and other insect bites. Calendula cream can relieve irritation and itching while also providing antiseptic benefits (source). A blister can be treated by dabbing some calendula ointment on it. This will help the skin heal faster. How to use calendula for insect bites? Cleanse the area with mild soap, rinse and dry. Apply a thin layer of Calendula gel onto the insect bite 3 times a day or as needed. BOIRON makes a great non-sticky, non-greasy first aid Calendula gel. It’s cooling and refreshing. You can buy it here. To learn more about calendula, check out this post: The Amazing Benefits of Calendula for Insect Bites, Cuts & Other Skin Irritations. Witch hazel is a liquid astringent produced from the leaves and bark of the North American Witch-hazel shrub (Hamamelis virginiana). Mostly used as a facial cleanser, it can also help calm itching caused by bug bites because it contains tannins that have a mild anesthetic effect. It has been shown to be useful in the treatment of various skin problems because of its anti-inflammatory properties (source). How to use witch hazel for bug bites that blister? Soak a cotton ball in witch hazel and place it on the affected area for 10 minutes. Aloe vera is a popular remedy to soothe skin, especially when it’s sunburned and blistered. In fact, it can also help treat bug bites that blister. Its active compounds and amino acids help ease itching and burning caused by insect bites. It also aids healing the skin. How to use aloe vera to heal blisters? Apply aloe vera gel on your bites a few times a day for a couple of days. It’s best to use fresh aloe vera, but you can also buy it. If you’re looking for a high-quality aloe vera gel, Amara Organics makes a great one. The thick gel-like Aloe you usually find in stores is often loaded with chemicals; this one is not! Plantain may be used externally to treat bug bites that blister. Native Americans used plantain leaves to relieve the pain of insect bites and bee stings. It helps stop the itching of allergic rashes and promote healing. How can you use plantain for bug bites? For relief from an insect bite, simply shred (or chew) a plantain leaf and hold it on the bite for a few minutes. A plantain ointment can also rapidly relieves itching and swelling. Have you ever heard of emu oil? Emu oil is extracted from the fat of the emu bird. Australian Aborigines knew the benefits of emu oil and used it to treat lots of different health issues. Emu oil can relieve the itch and reduce the swelling. It also enhances the healing process and reduces scarring. To learn more about the health benefits of emu oil, read this article! Apple cider vinegar is a popular remedy for bug bites. It helps relieve the itching and burning caused by bug bites. Choose an unpasteurized & organic apple cider vinegar. 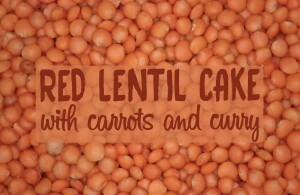 You want to keep the sediment (“the mother”) that contains healthy vitamins, minerals and enzymes. How to use it for insect bites? Dab organic apple cider vinegar on a cottontail and apply it on your bites. You may want to dilute apple cider vinegar with water if you have sensitive skin. Essential oils can help soothe bug bites and accelerate the healing process. Lavender and tea tree essential oils are the most commonly used oils to treat bug bites that blister. Eucalyptus, thyme, rosemary and manuka oil are also known to alleviate symptoms of bug bites. This essential oil works really well for bites, especially severe mosquito bites. Lavender is anti-inflammatory, calming, antiseptic, antiviral, bactericide, analgesic, cicatrisant, fungicide, nervine, relaxing and sedative. These properties make it perfect for treating stings and bug bites that blister. Check out this post and learn how to use lavender essential oil for mosquito bites. Tea tree oil comes from tea trees in Australia. This oil has been used by aborigines for hundreds of years for its natural healing qualities. Tea tree oil kills bacteria, fungi, and viruses. 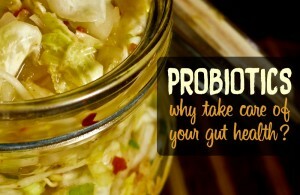 It effectively combats infections that are resistant to antibiotics. Other active components alleviate inflammation. 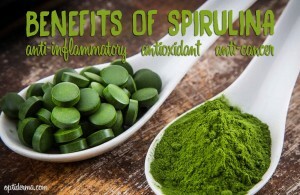 Its anti-inflammatory and antimicrobial components help with tissue regeneration. Using tea tree oil for insect bites that blister will also reduce the risk of infection. A few drops diluted in a carrier oil can be applied directly onto the bite. Use coconut oil as a carrier oil. Coconut oil is another antibacterial oil that is very soothing for itchy bites. It helps stop the itching and the inflammation. Note that tea tree or lavender essential oil may be used neat on bites. 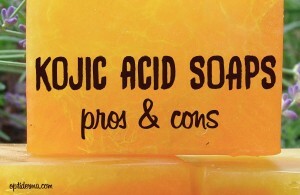 However it’s better to dilute it especially if you have sensitive skin. In you have any doubts, consult an aromatherapist or another qualified practitioner. If you have flea bites, learn how to use tea tree oil to soothe flea bites here. Care should be taken when applying essential oils. Always perform a skin patch test before use and be aware that essential oils may cause undesired health side effects if not used properly. Read this page about the best essential oils for skin to learn a bit more about the essential oils and how to use them! It’s best not to pop your blisters to speed up the healing process. I explain here why you shouldn’t pop them. According to WebMD, you shouldn’t puncture a blister unless it’s large, painful, or will cause further irritation if left alone. The fluid-filled sac is a protective cover to prevent infection. Blisters do not often cause pain unless they rupture, exposing the new skin underneath. How Long Does it Take for Blisters to Heal? If you develop a severe reaction to a mosquito bite, a bug bite or any other bite, consult a doctor as soon as possible to avoid serious health complications. In rare situations, some people experience anaphylaxis after being bitten by a bug. Some people can even experience whole body urticaria and angioedema (hives and swelling), or worsening of asthma symptoms after being bitten. 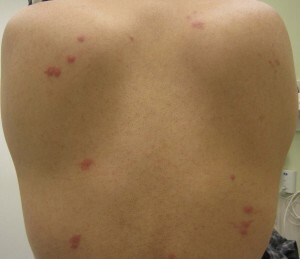 Some complications such as secondary bacterial infections are also sometimes associated with bug bites. Consult a doctor for proper treatment for non-healing bites. If you have many bites or a bite looks infected, you should see a dermatologist. Natural treatments can be quite effective at treating bug bites that blister. The best remedies are calendula, apple cider vinegar, aloe vera, witch hazel, emu oil, plantain, lavender and tea tree essential oil. Eucalyptus, rosemary, thyme and manuka oil also help alleviate symptoms of bug bites. Because prevention is better than cure, avoid bites by using an effective bug repellent. Use lemon eucalyptus oil or neem oil as a mosquito repellent. For ticks, consider using rose geranium oil. Use diatomaceous earth for bed bugs and peppermint oil for spiders. 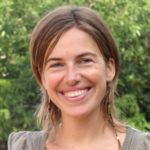 Josephine Beck is the founder of Optiderma.com, a website providing well-researched natural skincare and health advice. She's a Holistic Nutritionist. She graduated from the Nutritional Consulting Program of Alive Academy in Vancouver, Canada. 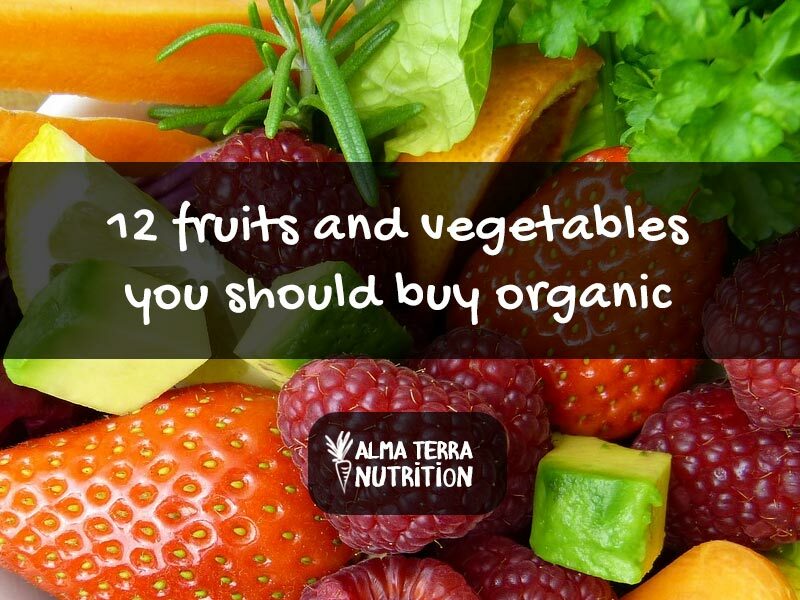 She launched her private practice Alma Terra Nutrition in 2018. Interested in Josephine's story? Read this! Dr Danielle Beck has worked as a physician for 40 years. She's now retired.